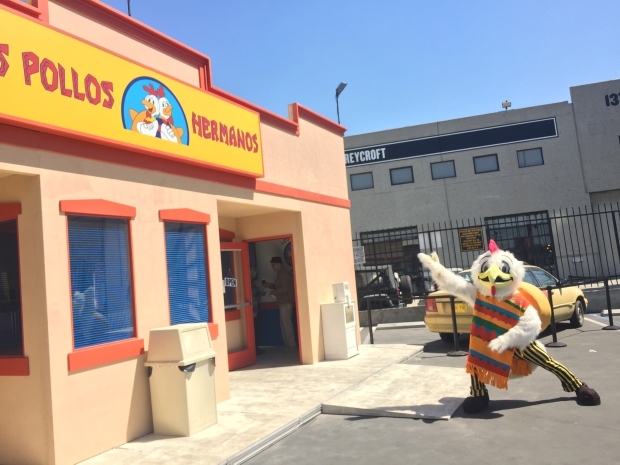 Gus Fring's infamous chicken chain featured in the TV show "Breaking Bad" came to downtown Los Angeles this week. Fring's Albuquerque restaurant served as a headquarters for both his chicken and meth empires on AMC's critically-acclaimed series. The pop-up restaurant near the Arts District featured Fring's famous curly fries on Wednesday and Thursday. The restaurant didn't actually serve a chicken dinner, but like DEA Agent Hank Schrader says on the show: "We're not here for the chicken." The real-life Los Pollos Hermanos will also pop-up in New York in April. The pop-up recently made a stop in Austin at SXSW where series stars Bob Odenkirk (who plays Saul Goodman) and Giancarlo Esposito (who starred as Gus Fring) signed autographs and greeted fans. You can stop by the Pollos pop-up at 1345 E. 6th St. in downtown LA from 12 p.m. to 10 p.m. Wednesday and Thursday. The third season of the "Breaking Bad" spin-off "Better Call Saul" premieres on AMC on April 10 at 10 p.m. EST.